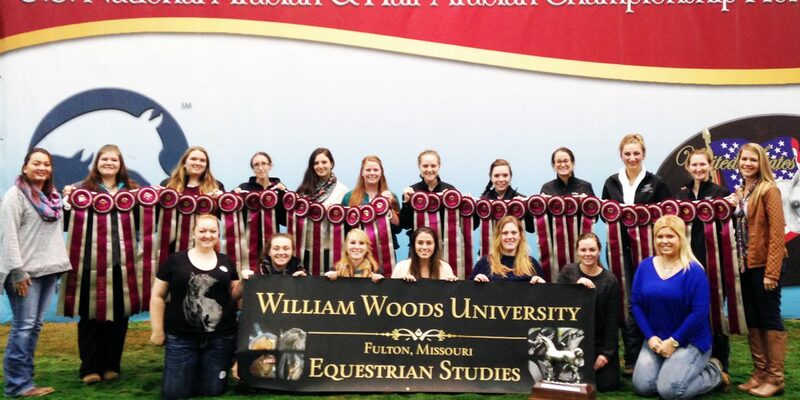 An equestrian judging team from William Woods University won a national championship Oct. 30 at the U.S. Nationals Arabian/ Half-Arabian Championships in Tulsa, Oklahoma. A second team earned a fourth place finish. 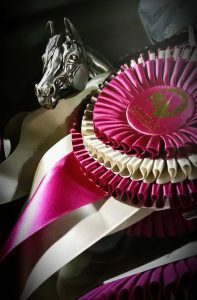 The contest pulled teams from all over the country with divisions for FFA/4H, Junior Arabian Horse Association, and Senior/Collegiate teams. All collegiate teams compete in same division for judging competitions and this creates an extremely competitive contest. 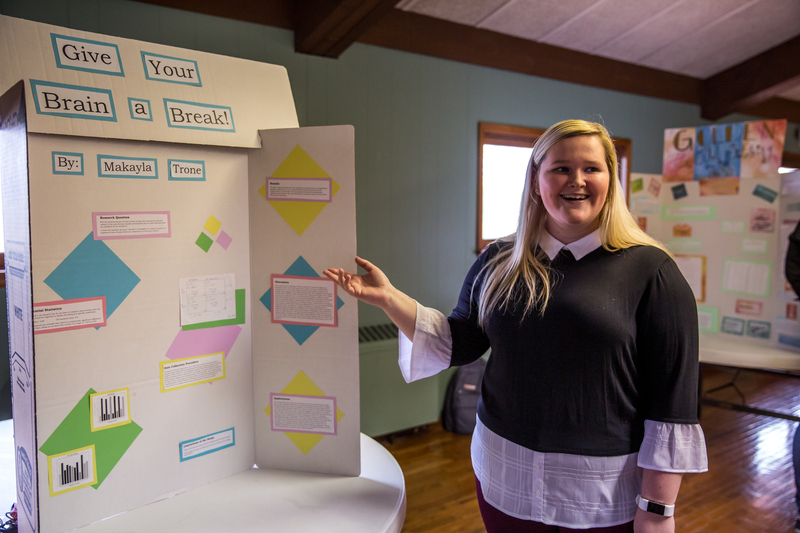 The winning WWU team (Team B) comprised Abigail Peterson of Muskegon, Michigan; Kayla Lancashire of Powhatan, Virginia; Patti Finch of Berryville, Arkansas; Jane Bond of Manistee, Michigan; and Stephanie Patterson of Grinnell, Iowa. The team earned a first place finish in the Halter division and a fourth place honor in the Performance division. This put WWU Team B at the top of the rankings overall and earned WWU a National Championship in the senior division. The team took home the national championship trophy, individual trophy buckles for the team and coaches as well as each earning a $250 scholarship. 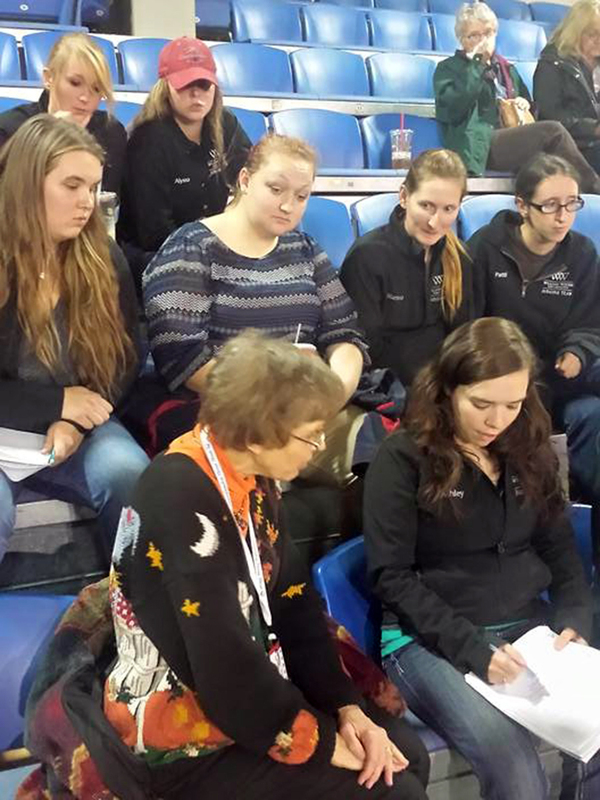 Gayle Lampe, professor emeritus of equestrian studies and a renowned judge, offers last minute tips to the students. William Woods Team A featured Jessica Scharenbroch of Kiel, Wisconsin; Ashley Larkins of Fort Lupton, Colorado; Sarah McRae of Boynton Beach, Florida; Hannah Overton of Monument, Colorado; and Marissa Boster of Girard. Colorado. The team earned a second place overall ranking in the Performance division, just one point below Michigan State out of a total of 1,600 points. The team also earned a fifth place overall award in the Reasons division. The composite scores put WWU Team A in a tie for third place in the contest and dropped to fourth after the tie-breaking rule was applied. Jennie Petterson debriefs the students after the critique. With two competition teams and seven learner judges, WWU had a big presenceat the contest. Each school is limited to sending two competition teams to the event. 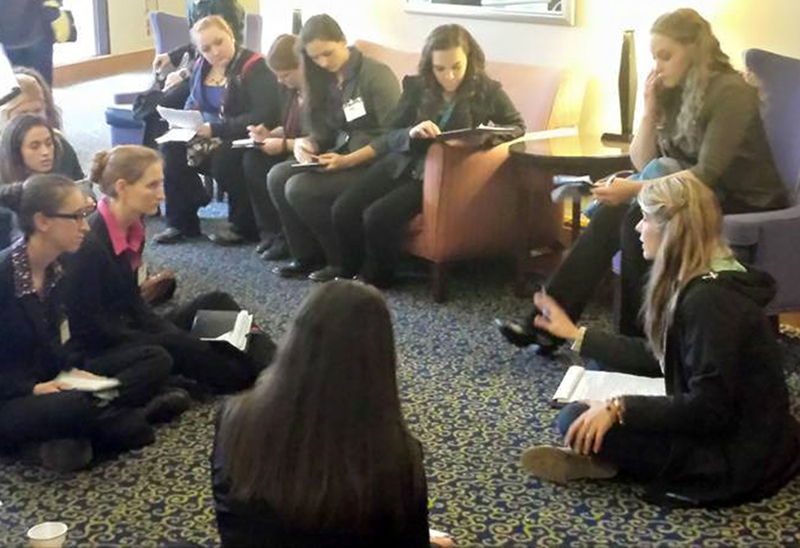 Students had to work through a vigorous selection process to earn a spot on a competition team. 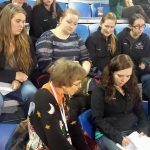 The William Woods judging teams are coached by Western Instructor Liz Haben and Equestrian Studies Division Chair Jennie Petterson. 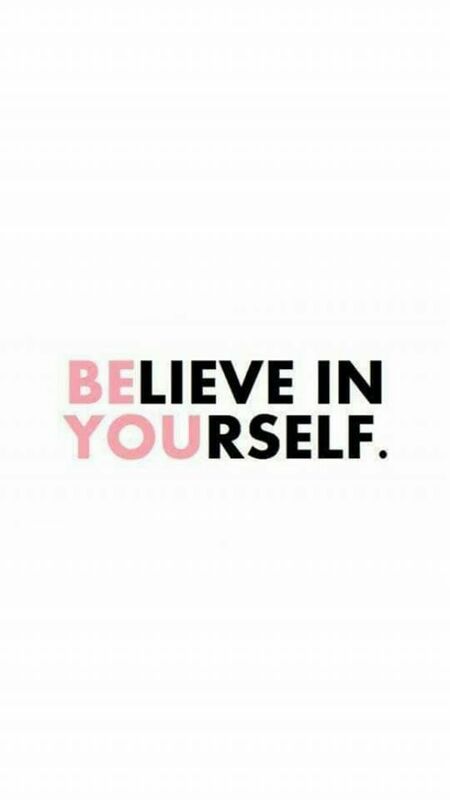 “Liz and I were determined to squeeze in more practices this year and started a Tuesday night and Saturday morning practice schedule starting in early September. It takes serious dedication to the team from coaches and students to prepare for a national contest,” Petterson said. In addition to team awards, students earned individual honors at the competition. Hannah Overton was fourth in the halter division and earned a ninth place overall. Sarah McRae was fifth in the performance division and earned an eighth place overall. Kayla Lancashire was the high scoring individual for WWU with a seventh in halter, eighth in performance and an overall ranking of fifth as a collegiate individual. 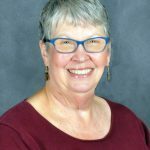 “The classes were excellent this year. 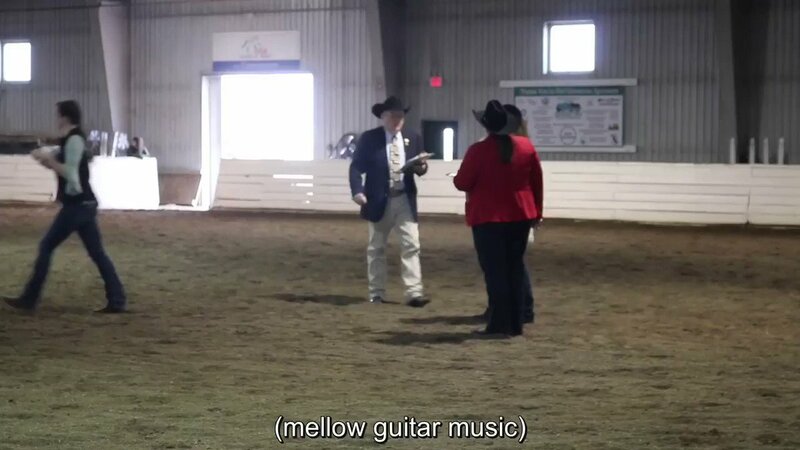 Students judged country English pleasure, saddle seat equitation, hunter pleasure, western pleasure, reining and side saddle in addition to four halter classes of purebred and half-Arabian horses. They really did well placing the classes and have improved their oral reasons. This made both teams very competitive,” Petterson said. The total points possible for the collegiate and senior teams was 2,800. WWU Team B finished the contest with 2,507 points. Michigan State pulled in 2,498 points for second, while Colorado State and WWU Team A tied for third with 2,494.